Okay, now back to Walls that Unite, it all started for me in 2015 when I saw a flyer announcing a study abroad trip to Mexico City and Guanajuato in the art department of Cal State Fullerton. I was instantly drawn and knew I needed to go. Even though there were a few financial setbacks deterring me from going, I signed up with only a couple days before the deadline. It was an incredibly enriching and well-rounded experience. 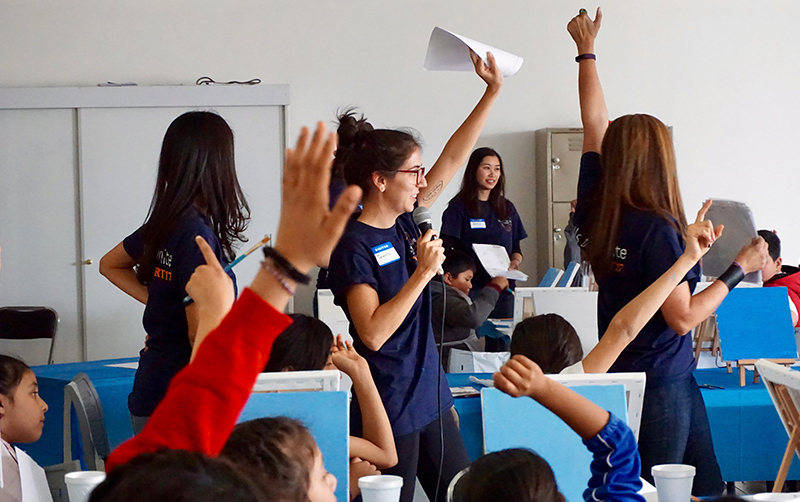 I had the opportunity to foster meaningful relationships, learn about Mexican art, and most importantly develop a stronger sense of pride and connection to the country I was born in. In the planning stages of a second study abroad trip for 2017, Professor Rose Adams felt it was necessary to add a service-learning component. Rose conceived of the idea of facilitating a canvas mural project between the CSUF students and young Mexican students from a rural municipality of Guanajuato called Ojos de Agua. I am also from a small town in Mexico, and I was never really exposed to art as a young girl, this idea struck a chord with me. I foresaw the power and impact a project like this could induce. Mind you the political climate of late 2016: then presidential candidate Donald Trump was spewing ignorant and xenophobic rhetoric against Mexican immigrants and wanted to divide the nations by building a border wall. Thus, the idea of painting a mural with young Mexican students seemed necessary and important. 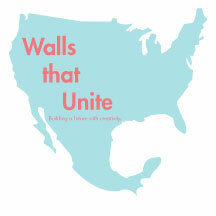 Metaphorically and literally we would build a wall (mural) that united Mexican students with U.S. college students. I was privileged enough to go on the second trip and facilitate the drawing and painting component of the mural workshop. I gave a technical lesson in Spanish over a microphone, but the real work was left to my fellow classmates who sat with the students and individually painted with them. In all honesty I was very nervous because I wanted to do a good job and naturally I am an introverted and shy person, so speaking on a microphone in front of an audience was not easy for me. However, I experienced some of the most beautiful and meaningful moments of my life. Most of my classmates didn’t speak Spanish and the kids of Ojos de Agua didn’t speak English. However, they were able to communicate despite the language barrier because they were speaking in the language of art, which has, to borders. The kids rendered beautiful images of studying in universities, traveling the world, becoming teachers, and building homes. The canvases were later united forming a mural that was mounted directly on the Community Center of Ojos de Agua (thanks to Laura Black and Jade Jewett). The day continued with the students giving us a tour of their rancho (town)- they showed us their elementary school, we at pozole and dance to a live Banda group in the middle of the main street of Ojos de Agua. The kids were sad we only stayed for one day, and a group of about 5 girls and boys would say goodbye run home, only to run back for more hugs over and over again. They made us promise to return soon, and many member of the group have returned on multiple occasions since January of 2017. My hope for Walls that Unite is that we continue to serve and learn from the community of Ojos de Agua by a mutual exchange of friendship and solidarity. As well as with the rest of the schools and communities have since connected in Orange County. I hope that year-by-year we meet community spaces to make art, and continue to sow and nourish the importance of community and education. I realize that my previous sentence is very abstract, so I want to clarity with a vivid dream I have for Wall that Unite and Ojos de Agua. 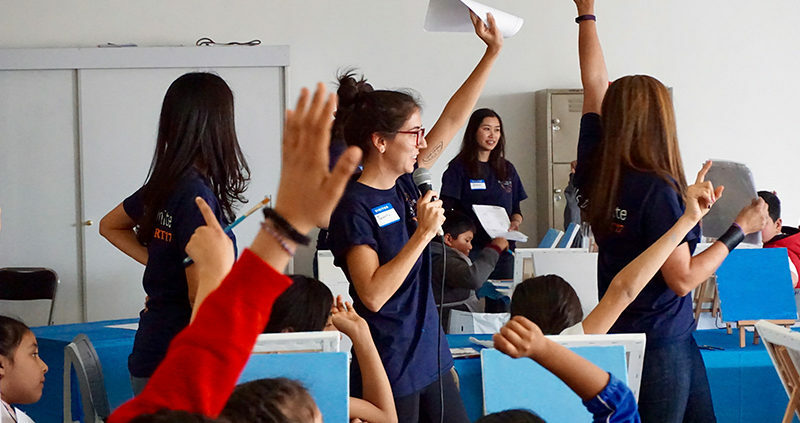 I hope that by 2028 (the year the student we first worked with turn 18) borders are dismantled and the group of fifty kids from Ojos de Agua we served in January of 2017 come to Cal State Fullerton on scholarship or in any state or country of their choosing. With that said, I believe in this project with all my heart and even if a border wall is erected- I know we will always find a way to unite no matter what.